One of the properties of radar is that it can pass through hundreds of metres of ice to be scattered by the bedrock beneath and return to the surface with sufficient remaining power to allow measurement of ice depth from the time between transmission of a pulse and that when the scattered energy returns to the antenna. Liquid water simply absorbs the radar energy preventing any return from the subsurface. As far as rocks and soils are concerned, any water in them and the structure of minerals from which they are composed limit penetration and energy return to at most only a few metres. While radar images that result from scattering by the Earth’s solid surface are highly informative about landforms and variations in the surface’s small-scale texture, outside of seismic reflection profiling, only ice-penetrating radar (IPR) approaches the ‘holy grail’ of mapping what lies beneath the surface in 3-D. Unlike seismic surveys it can be achieved from aircraft and is far cheaper to conduct. 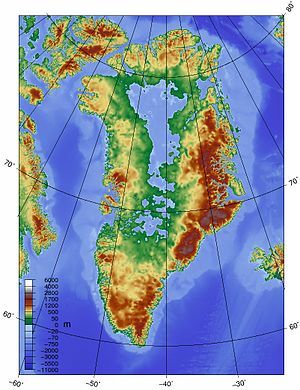 It was IPR that revealed the scattering of large lakes at the base of the Antarctic ice cap, but a survey of Greenland has revealed something even more astonishing: major drainage systems. These include a vast canyon that meanders beneath the thickest part of the ice towards the island’s north coast (Bamber, J.L. et al. 2013. Palaeofluvial mega-canyon beneath the central Greenland ice sheet. Science, v. 341, p. 997-999). At 750 km long and a maximum depth of 800 m it is comparable with active canyon systems along the Colorado and Nile rivers in the western US and Ethiopia respectively. A less-well publicised feature is ancient leaf-shaped system of buried valleys further south that emerges in a great embayment on West Greenland’s coast near Uummannaq, which may be the catchment of another former river system. In fact much of the data that revealed what appears to be pre-glacial topography dates back to the 1970s, though most was acquired since 2000. The coverage by flight lines varies a great deal, and as more flights are conducted, yet more detail will emerge. This entry was posted in Geomorphology, GIS and Remote Sensing and tagged Grand Canyon, Greenland, Radar. Bookmark the permalink.